The tiny single-cell aquatic plants that produce half of all our oxygen are threatened by ocean acidification. Maureen Howard talks to researchers about the danger and what’s to be done. Oceans gift us more than just a bracing walk on the beach, a feed of paua or the glimpse of a humpback whale from a boat off Kaikoura. At the base of the oceans’ foodweb are a multitude of single-celled phytoplankton species that produce 50% of the world’s oxygen and remove atmospheric carbon dioxide. Phytoplankton might drift with the ocean currents, but they arguably drive the flourishing of life on earth. And now they are under threat. As rising atmospheric CO2 drives ocean acidification, shelled members of the foodweb are in trouble. In particular, scientists have discovered that the larvae of shellfish are unable to form shells. Oyster hatcheries off the west coast of the United States, where marine pH is lower than around New Zealand, are experiencing higher mortality rates, , researchers at Oregon State University have found. We could rear commercial shellfish in controlled pH conditions, but we can’t babysit all of the world’s marine life to safe adulthood. And phytoplankton must fend for themselves. Fortunately, with regard to ocean acidification, the outlook is not all bad. “When you look at ocean acidification you’ve got winners and losers” says Prof Cliff Law, who is programme leader of CARIM (Coastal Acidification: Rate, Impacts & Management), a four-year MBIE project on ocean acidification that is bringing a range of stakeholders, from fisheries, conservation, and the science community, together. Aquatic plants such as phytoplankton need CO2 to photosynthesise so “the more CO2 going into the water the greater the fuel for photosynthesising,” Prof Law says. Overall, in terms of ocean acidification, so far researchers around the world are seeing only “relatively minor changes” for phytoplankton, he says. It sounds good, but unfortunately, phytoplankton are not one homogeneous group. “We have lots and lots of different phytoplankton groups and species and they all have different and very important ecological roles,” says Dr Linn Hoffman, of the University of Otago’s botany department. As ocean acidification becomes more pronounced, it will affect the types of phytoplankton present, which will affect the chemistry of the system as well as the foodweb itself. “All of these different phytoplankton [species] have different effects on the chemistry of the water,” Law says. One group of phytoplankton that “might suffer and decline” are the pteropods, which have beautiful carbonate shells and are commonly called “sea butterflies”. These are food for grazers, says Law, and in the Ross Sea are “really quite important in the food web”. Experiments and observations show that they will have trouble “maintaining their shells”, particularly in colder waters such as the Ross Sea where some of the first impacts of ocean acidification are expected. Research led by Dr Hoffman suggests that “toxin-producing species will become more abundant under ocean acidification”. Her PhD student Ro Allen is studying phytoplankton growing around volcanic vents near Japan, where CO2 bubbles out of the sea floor, and has discovered homogeneous mats of densely growing phytoplankton around the vents. “It has just covered and smothered everything completely,” Hoffman says. In contrast, just a few hundred metres away in water of normal pH are diverse coral reefs. Hoffman says that ocean acidification is “just one stressor on top of a lot of other stressors. It looks like ocean warming will have stronger impacts, but taken together the effects can actually be quite dramatic in some cases”. Ocean warming is already the focus of concern. A 2010 Canadian study published in Nature calculated that the biomass of phytoplankton in the oceans has declined 1% per year since 1899. One suggestion is that with oceanic warming, there is less mixing of waters and therefore less nutrient for phytoplankton. Research suggests that phytoplankton are already on the move and migrating toward the poles. “This will mean a change in regional productivity, declining in tropical regions, but potentially increasing in temperate regions,” Law says. Law works on coastal phytoplankton, with a team at NIWA Wellington, doing research in huge “test tubes”, each of which contains about four tonnes of seawater. Acidic conditions are manipulated in the test tubes to mimic projected levels of ocean acidification and warming. The study of ocean acidification doesn’t yet have the superstar status that climate change has. 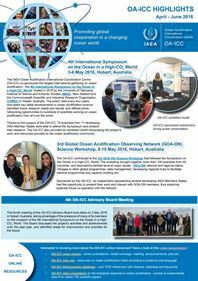 However, the hosting in Dunedin last month of a Commonwealth Ocean Acidification Action Group Workshop may signal a change of momentum, no doubt in part due to the establishment of the national CARIM programme. Ocean acidification is happening now, says senior lecturer Dr Christina McGraw, of Otago, one of the organisers of the workshop. There is urgency. According to the latest Intergovernmental Panel on Climate Change report, the global community must take decisive action within the next 12 years to limit global warming to 1.5degC. 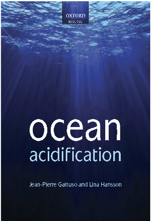 Oceans are alkaline environments that until recently, have maintained a very stable pH of 8.2 for 8million years. As waves crash and capture air bubbles, CO2 dissolves and produces carbonic acid, which causes the oceans to become more acidic. The result is that 25-30% of all the excess CO2 released into the atmosphere since the industrial revolution has been absorbed by the planet’s oceans, reducing its pH to about 8.1, a 30% increase in acidity on the logarithmic scale. So, while the ocean has been protecting us from more severe climate change, this has caused the pH to decline. It is projected to drop further to 7.8 or 7.7 by 2100, which equates to an increase in ocean acidity of about 150%. Maureen Howard, Otago Daily Times, 8 April 2019. Article.